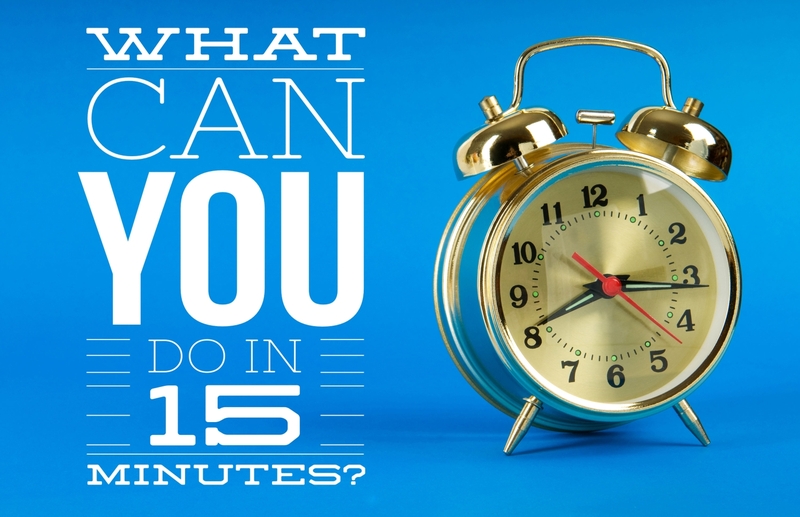 Think you cannot get anything done in just 15 minutes? In fact, some of my most productive work is done in 15-minute blasts. Although I use 15 minutes as a standard, you may do some of your projects in 10, 20 or 30 minutes, depending on the time you have available or your maximum attention span. The time you spend is not the key, it is how you approach the project. Here are some ways you can power through your to-do list, 15 minutes at a time. First, get past the idea that you can not accomplish anything in 15 minutes. Many tasks expand to fill the time available, so if you have two hours it will take two hours. When you only have 15 minutes, you will be amazed what you can do in just15 minutes. Don’t believe me? Think about this: How long would you say it takes to clean your house? Now, imagine that your mother-in-law will be at the door in 15 minutes. How long will it take to clean your house? Get my point? I can hear some of you now saying, “But if I do something in 15 minutes, it won’t be perfect. I need more time.” No, it won’t be perfect. But it will not be perfect if you spend eight hours on it, either. Your quest for perfection is stopping you from doing the things you should be (and could be) doing. You may have heard the expression, “The perfect is the enemy of the good.” It is absolutely true. Striving for excellence is a good idea. Thinking you have to be perfect is not. So let’s look at how you can get more done in the next 15 minutes. Start by choosing a reasonable definition of the task. Although you can not write a book in 15 minutes, you can write or edit a draft of a blog post or short article. You can not organize your office, but you can get through one desk drawer. Gather any tools or materials you need. Clearing out a file drawer? Grab a trash can to discard the stuff you do not need. Making some phone calls? Get the phone, your list of numbers and perhaps a glass of water. Set a timer. You do not want to spend your time staring at the clock, so set a timer for the time you have allotted for the task. Work. Do not stop to check your email, answer the phone, or anything else. Just work on the task at hand. Play some music if it helps you work better, but do not have music or television playing if they will distract you. Focusing on what you are doing is the key. I think of it almost as a game: How much can I do in just 15 minutes? When the timer goes off, stop. If you have not quite finished what you set out to do, you may decide to keep working for a few more minutes. That’s fine. Just do not keep at it so long that you lose focus. And if you finish before the timer goes off? Great! Stop when you finish. Wrap up. Save your file, take out the trash, whatever you have to do to conclude your task. How does that feel? I always feel energized by getting something done. Usually, I am ready to take on another 15 minute project. Sometimes, I spend a few hours doing 15 minute projects, one after another. To keep my focus sharp, I mix them up. Write a draft of a blog post. Clear out my inbox. Do the dishes. Edit an article I wrote the day before. Take a walk. Get rid of some excess “stuff.” You get the idea. Now, what will you do in 15 minutes? Post your favorite 15-minute accomplishments in the comments. Thank you for these specific and terrific ideas in this post. I’ve also found I can accomplish a lot in 15 minutes. These insights are valuable. I like doing 15-minute tasks. When my boys were little I made a game out of cleaning. We would beat the clock each time we had to clean up. They enjoyed it.